“An acclaimed and versatile conductor, Carlo Maria Giulini started his musical studies as a violinist, attending the Santa Cecilia Conservatory in Rome. He studied conducting with Bernardino Molinari at Santa Cecilia and Alfredo Casella at Accademia Chigiana in Siena. After graduation, he joined the Augusteo Orchestra in Rome as a violist. As an orchestral musician, he came in contact with the great conductors of the time, including Strauss, Mengelberg, Walter, Klemperer, and Furtwängler. After receiving his conscription notice for military service during World War II, Giulini, an ardent anti-Fascist, decided to go into hiding. When the Allies liberated Rome in 1944 he emerged and conducted the orchestra he used to play in (now known as the Orchestra of the Accademia di Santa Cecilia) in a Brahms symphony to celebrate the liberation. This was his début as a conductor. He was subsequently hired as an assistant conductor for the Italian Radio Orchestra, becoming chief conductor in 1946. During his tenure as conductor of the Italian Radio (RAI) Orchestra of Rome, he attracted notice for his innovative programming which included revivals of forgotten operas by Italian Baroque composers, such as Domenico Scarlatti. His theatrical début was at Bergamo, in Verdi's LA TRAVIATA. In 1950, he was sent to help organize a new RAI orchestra in Milan. 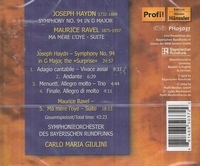 His broadcast reviving the nearly forgotten Haydn opera IL MONDO DELLA LUNA was noticed by many, including legendary conductor Arturo Toscanini and La Scala's principal conductor, Victor de Sabata. He began conducting at Milan's La Scala in 1952, débuting with Manuel de Falla's LA VIDA BREVE. He was engaged as an assistant conductor, succeeding de Sabata as principal conductor in 1953. Among his most notable performances was a classic TRAVIATA with Maria Callas. Giulini added new works to the La Scala repertory, including Bartók's BLUEBEARD'S CASTLE and Monteverdi's L'INCORONAZIONE DI POPPEA, and worked with stage directors such as Franco Zeffirelli and Luchino Visconti. Although Giulini premiered in England at Glyndebourne in FALSTAFF, it was his direction of Visconti's production of DON CARLOS at Covent Garden that made him well-known in Britain. In 1955, he débuted in the United States with the Chicago Symphony Orchestra. Giulini developed a symphonic repertoire slowly, devoting much attention to each new score; thus, he did not conduct Mozart or Beethoven symphonies until he was in his fifties. He was appointed principal guest conductor of the Chicago Symphony in 1969, and was the director of the Vienna Symphony Orchestra from 1973 to 1976. He succeeded Zubin Mehta as musical director of the Los Angeles Philharmonic in 1978, remaining at that post until 1984.